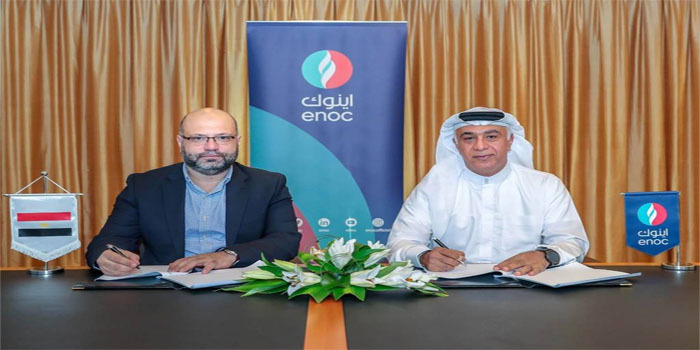 Emirates National Oil Company (ENOC) Group on Monday announced that it has signed a joint venture (JV) agreement with Proserv Egypt to establish its first on-ground operations in the lubricants sector in Egypt, ENOC Misr. Dubai-based firm said in a statement. “We are proud to establish ENOC Misr as it offers a unique opportunity for knowledge sharing between us and industry experts like Proserv Egypt,” Saif Humaid Al Falasi, CEO of ENOC, said. ENOC’s product portfolio includes a diverse offering of lubricants services and products, in addition to jet fuel, liquefied petroleum gas (LPG), lubricants, bulk fuel, aviation, marine and alternative fuel such as compressed natural gas (CNG). The company’s products are distributed in over 60 markets in the Middle East, Indian Subcontinent, South and Central Asia and Africa, according to the statement. “Our partnership with ENOC to establish ENOC Misr is a strategic move in line with our efforts to further enhance our market offering and explore new opportunities. We are confident that ENOC Misr will be a key game changer in the future of Egyptian downstream market.” Ahmed Hashem, chairman of Proserv Group, said. ENOC Group will also leverage its diverse product portfolio that caters to the entire energy value chain on the back of its existing lubricants and aviation fuel business in Egypt. Moreover, the company eyes further expansion in Egypt and other countries over the coming few years.